This is our one-year anniversary post. 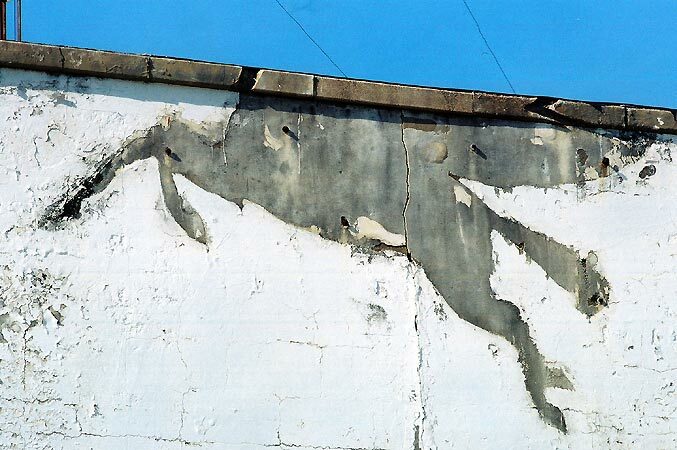 On April 26, 2005, after much urging by friends, I started this blog and used only three photographs from the following post; I didn't quite have the hang of it. The trip this post relates was made on April 16 and 17 of that year and was part of a stay in the Ozarks of Missouri. 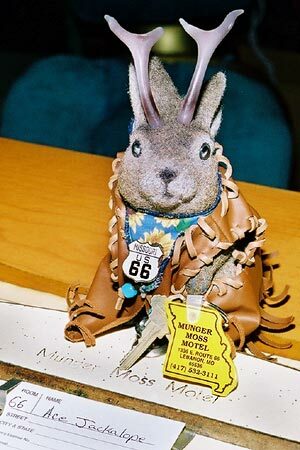 Ace did not yet have his custom made travel clothes, but he had already been on a few journeys with me, including trips to the Pacific and Atlantic coasts and much travel on Route 66. Perhaps we'll eventually get those online. 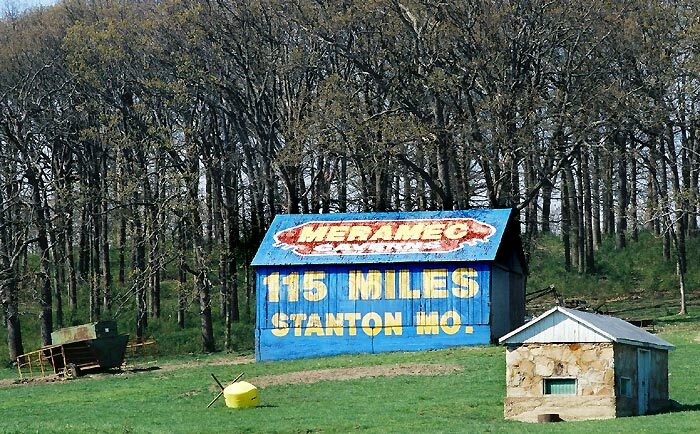 We started from Strafford, MO on Route 66 going east. 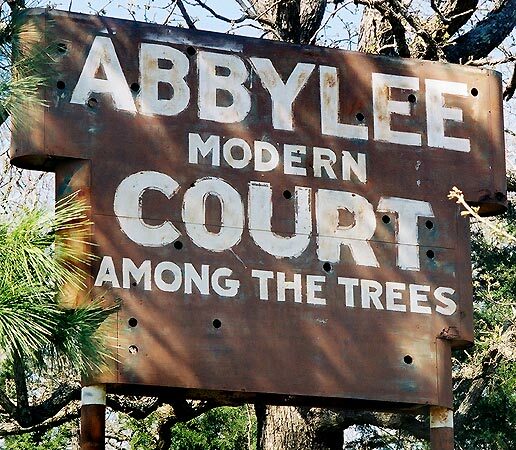 About six miles west of Conway, we encountered what is left of Abbylee Modern Court. 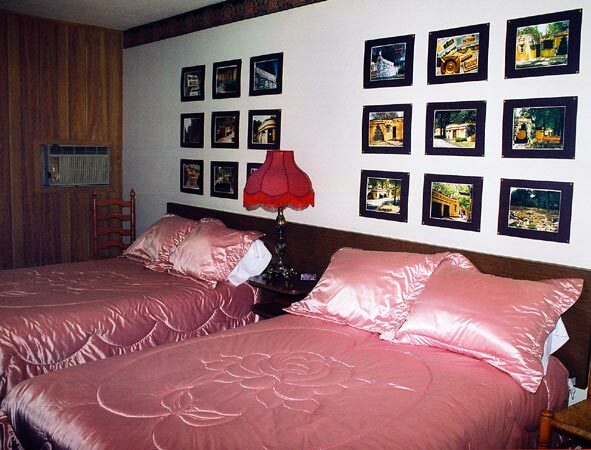 The motel business is defunct and the cabins appear to be apartments. 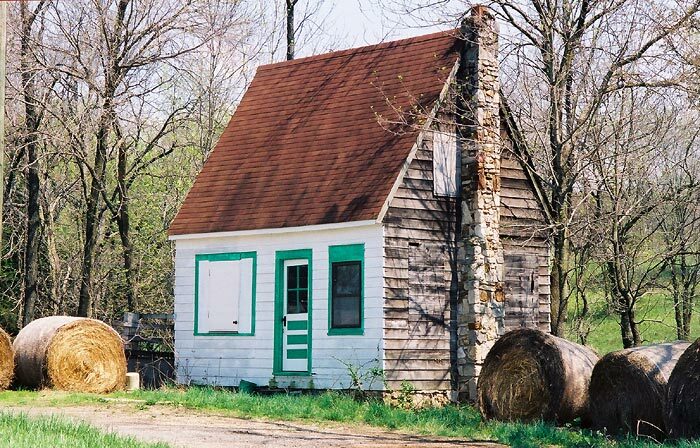 Before we reached Lebanon, two nicely painted Meramec caverns barns presented themselves. 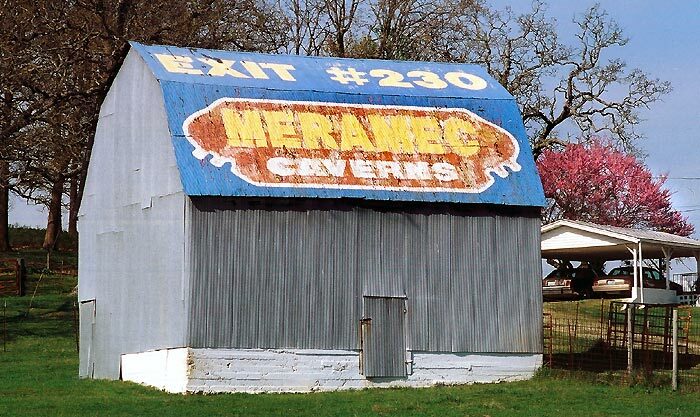 It wouldn't be a trip through Missouri without Meramec Caverns barns every few miles. The coolest thing we saw in the city of Lebanon was this ghost of a Mobile Oil Pegasus. 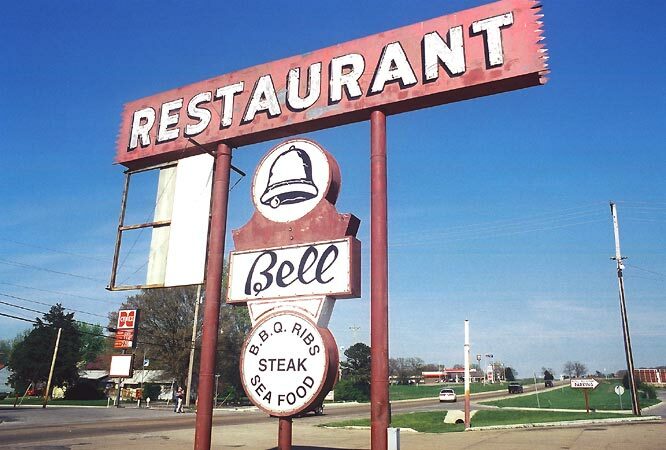 The Bell restaurant has been here since 1964, according to its current owner. This is the west side of its sign; thats Route 66 in the background. 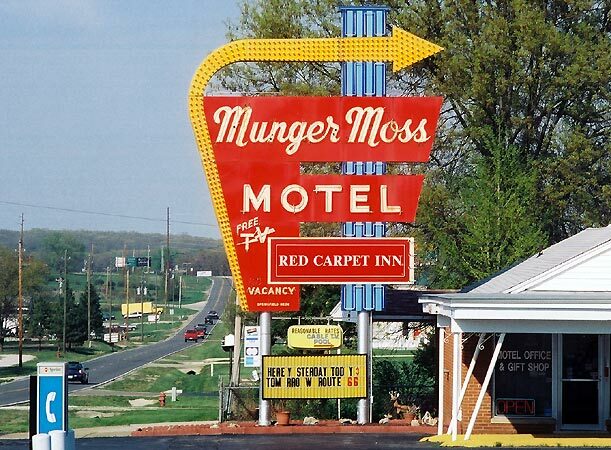 Shortly after the Bell, Route 66 turns north (left), and up the hill we saw the beautiful sign for the Munger Moss Motel at 1336 East Route 66. 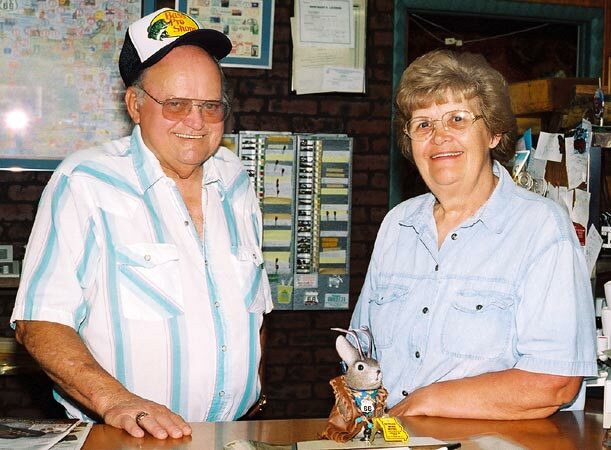 Bob and Ramona Lehman have owned the Munger Moss since 1971; it was built in 1946 as a 14-cabin motor court. The garages between the rooms were eventually filled in and many more units were added. We secured a room and moved on to the northeast on Route 66. 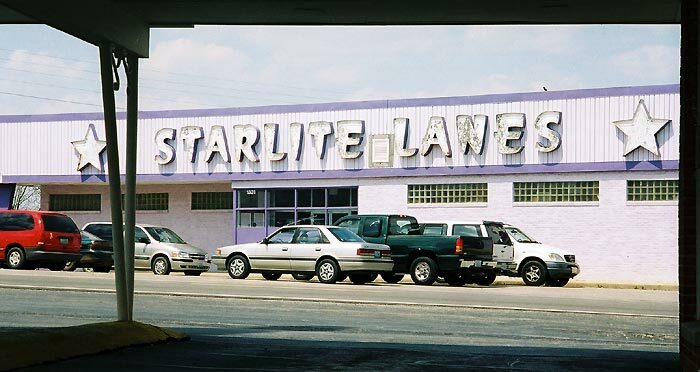 Across Route 66 from the Munger Moss, on the west side of the highway is the Starlite Lanes bowling alley. Northeast of the Munger Moss and the Starlite, spectators were pouring into the Lebanon I-44 Speedway, which is actually on Route 66. 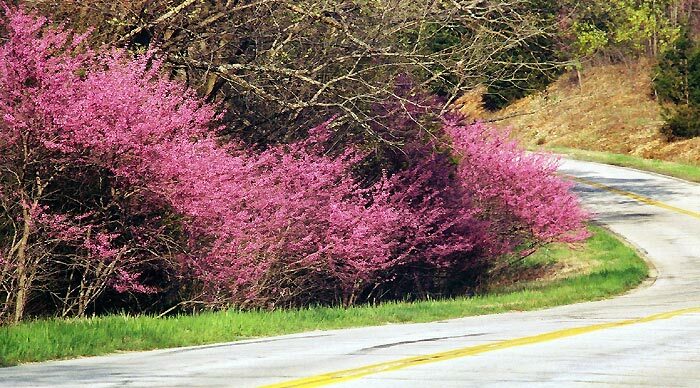 Moving on northeast toward Waynesville, we relished the site of redbud trees in the Ozark Spring. Ramona Lehman helped me to identify the following three structures. This is an old tavern just west of Hazelgreen; she says it operated even into the 1990's. 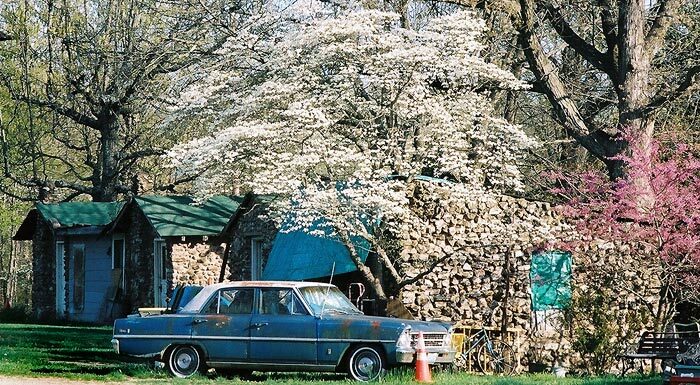 Also near Hazelgreen, nature reclaims a gas station. Ramona says it was a recycling station by the mid-1970's. 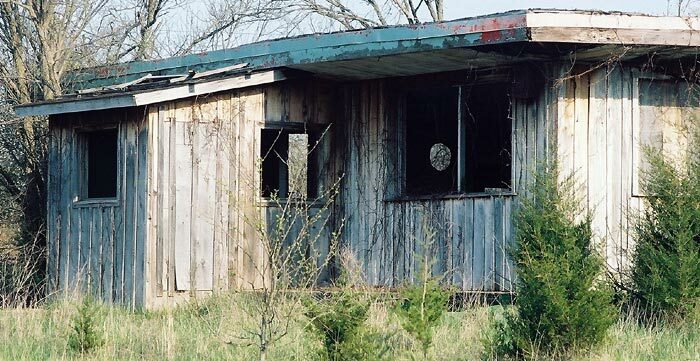 This set of cabins near Gasozark was probably once a motel. I didn't see any remnant of a sign, though. We turned off Route 66 onto Highway 7, well before Waynesville, and did some exploring. We returned to the Munger Moss after nightfall. 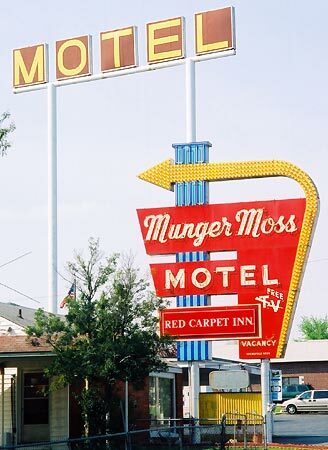 The sign dates from about 1955 and used to be closer to the ground; it was later raised for greater visibility when a bypass was constructed and traffic moved farther from the motel. This is the north side of the sign. 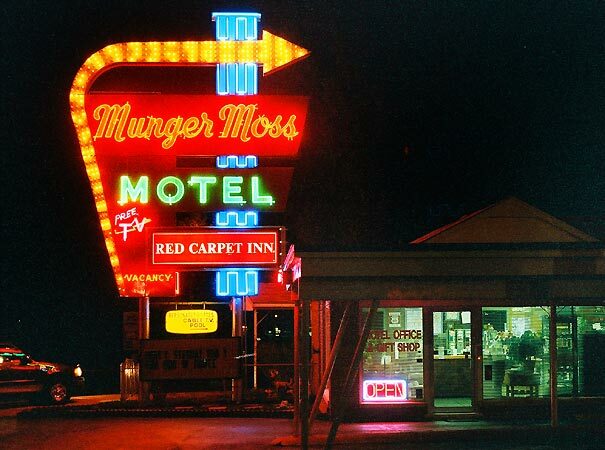 Across Route 66, The Starlite beckoned. We settled in for a long and fitful sleep. 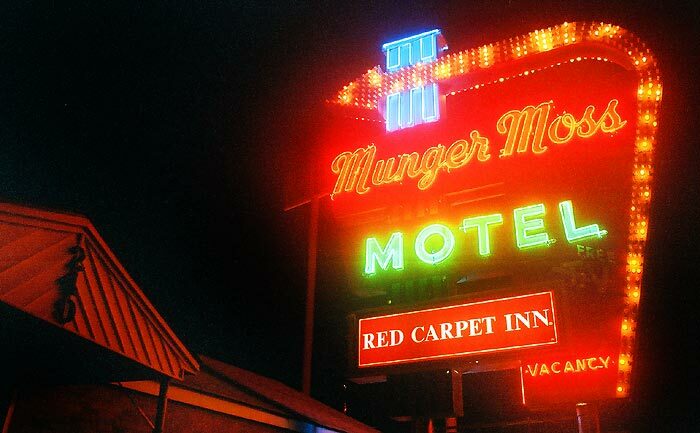 In the morning, I shot the main sign with the much taller generic "MOTEL" sign that was erected in the late 1970's or early 1980's by the Lehmans. 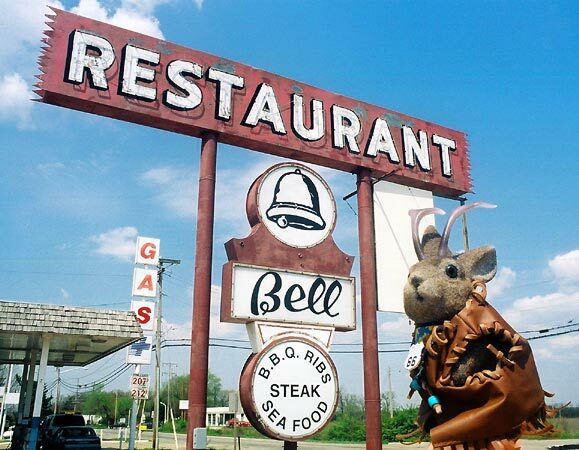 We headed back down Rt66 to the Bell Restaurant for breakfast. 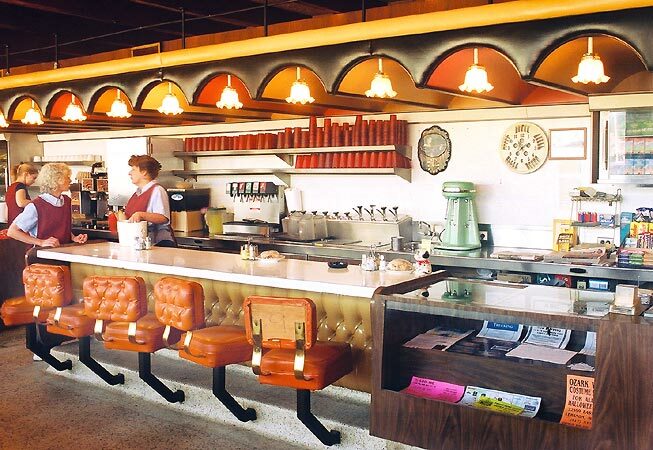 The building dates from 1964 and, according to the current owner, who has had it for 25 years, it has not been altered. I love the 1960's colored panels. I don't know if the structure above the the work area behind the counter has a name, but it appeals to me. The cantilevered stools are nice too. Unfortunately, the front of the restaurant is a smoking area. This is the non-smoking section in the back of the building. It's pretty dull. Breakfast was fine. 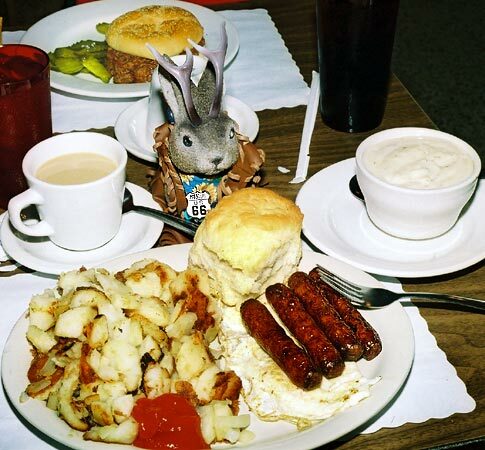 I'm afraid I'm not much of a breakfast connoisseur, so unless it's something really unusual, its all the same to me. You know, I'm pretty marginal on whether to include food shots, but some of the emails we receive indicate there is a sizable contingent of people planning trips who like to see them. 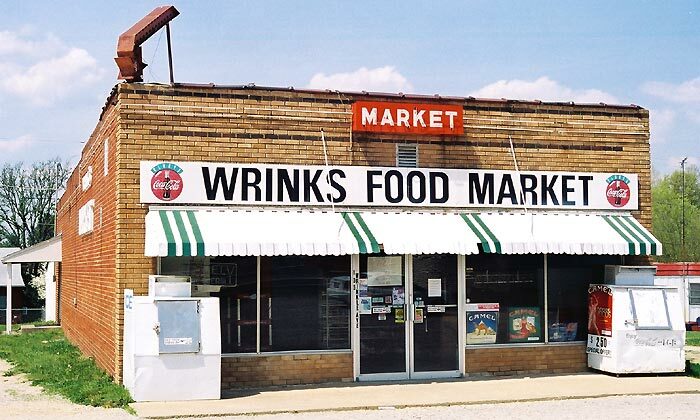 After breakfast I took a look at Wrink's Food Market. 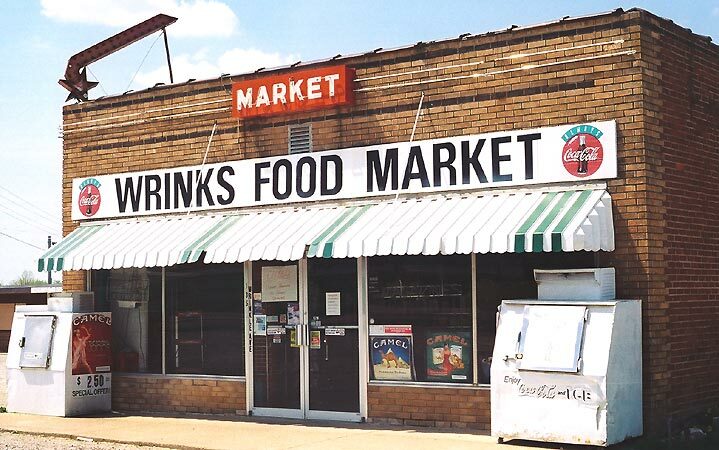 Wrink's was opened on June 10, 1950 by Glenn Wrinkle and operated for almost 50 years. At the time of this writing, the building is vacant. 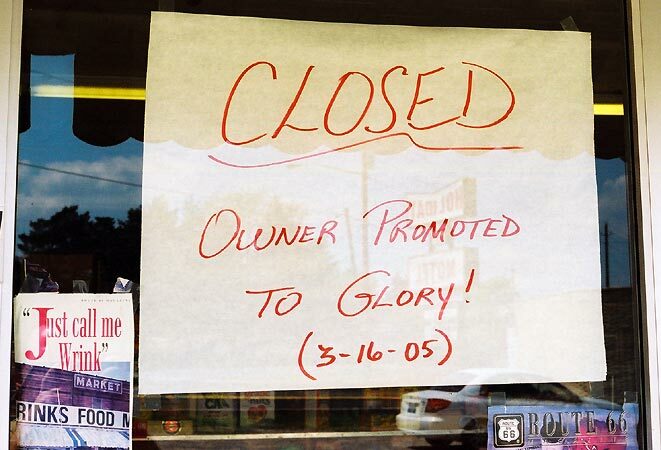 Sadly, we had missed Mr Wrinkle by a month or so; the store had closed on February 21, 2005. 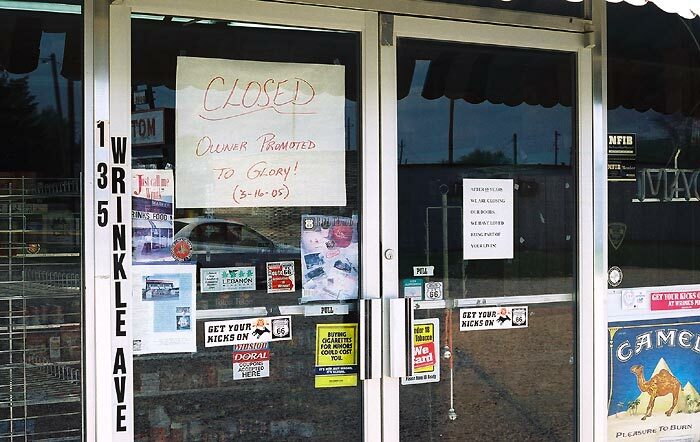 Glenn Wrinkle died on March 16, 2005; he was a Route 66 institution and I'm sorry I never met him. Some other nice Route 66 theme signage on the front of the store. 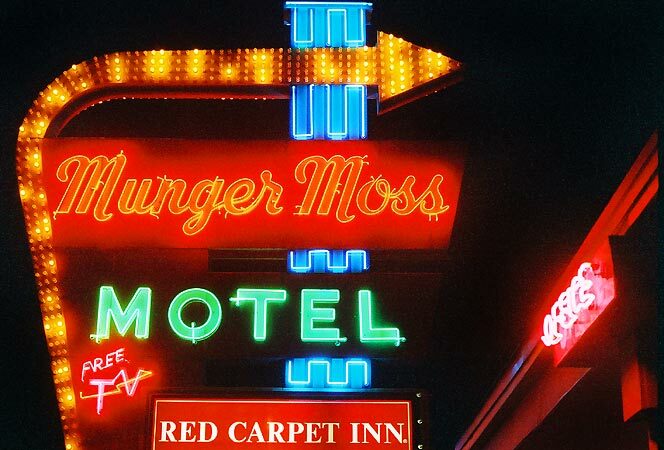 Heading back up to the motel, Starlite Lanes is framed by the portico of the Munger Moss. This old sign was not functional last year, and when I called to check for updates on everything before writing this post, the management told me they had disposed of it a few months ago. It's a shame, and just one of way too many justifications for photographing everything while you can. Inside, most of the place is nothing unusual. 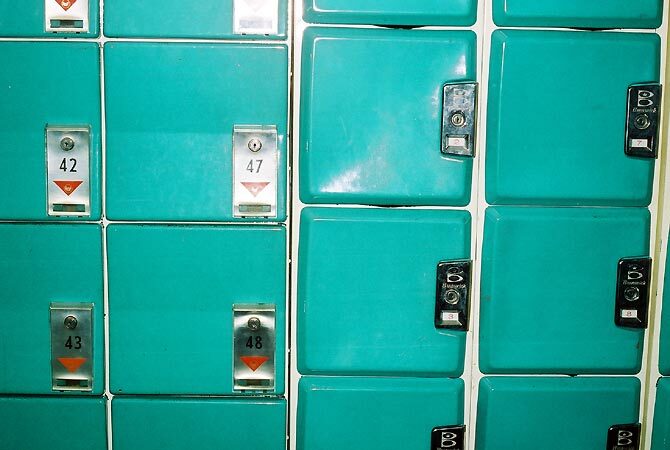 But the lockers look like they might be original to the building's late 1960's vintage. 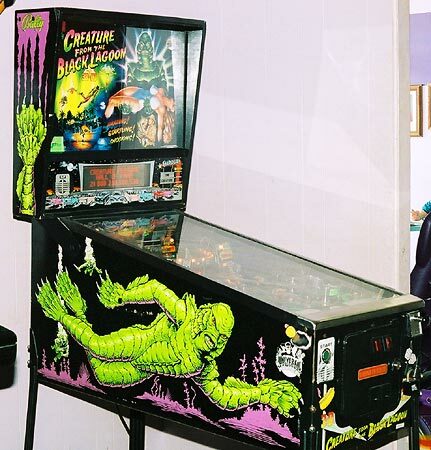 I've always been a fan of the Creature from the Black Lagoon but didn't know there had been a pinball machine. 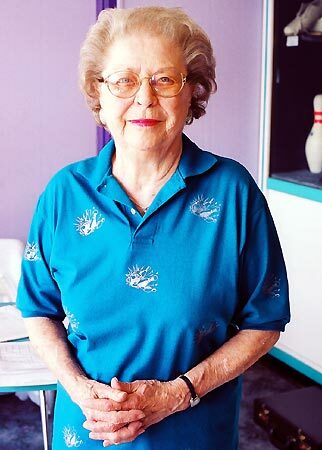 Nadine Davidson has been a bowler nearly all her life and helps with many bowling activities. I enjoyed the way the diffused lighting enfolded her amid the overwhelming purpleness of the place. I seem to find tiki in the oddest places; it shadows me like a welcome friend. 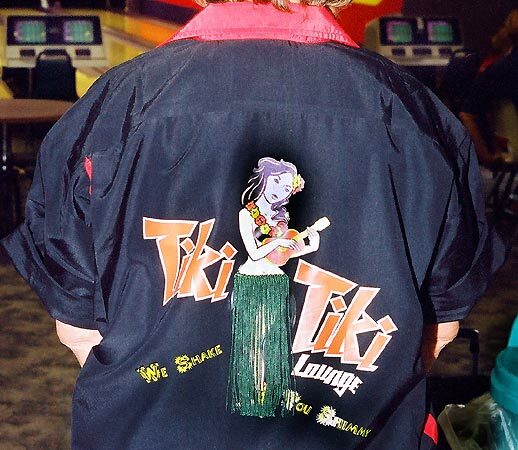 The back of this bowling shirt reads: Tiki Tiki Lounge We Shake You Shimmy. 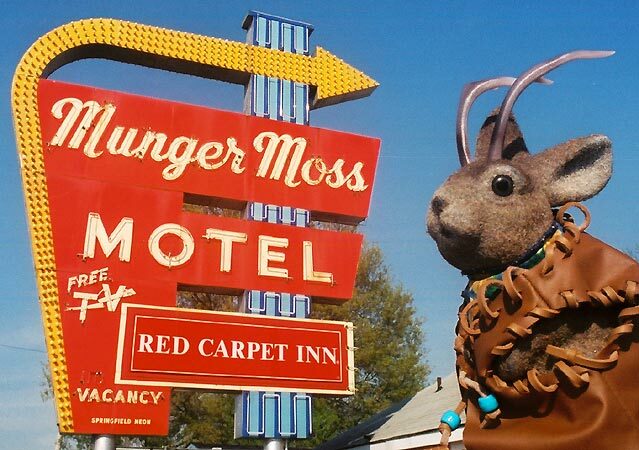 Back over at the Munger Moss, we got a chance to look at two of the themed rooms before we left town. 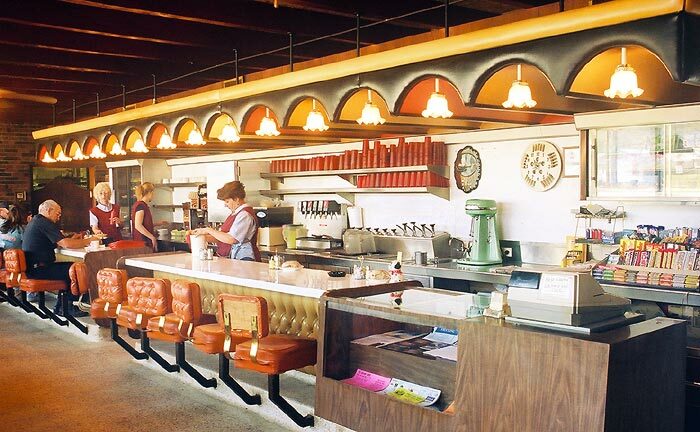 This is the Coral Court tribute room and features many photographs of that defunct St Louis Route 66 institution. 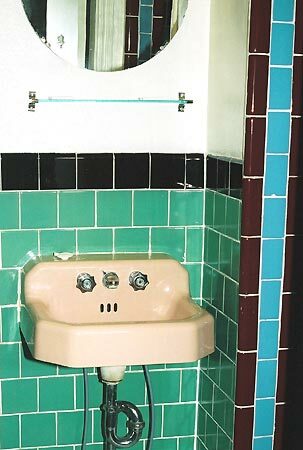 I love the tile in the bathroom. 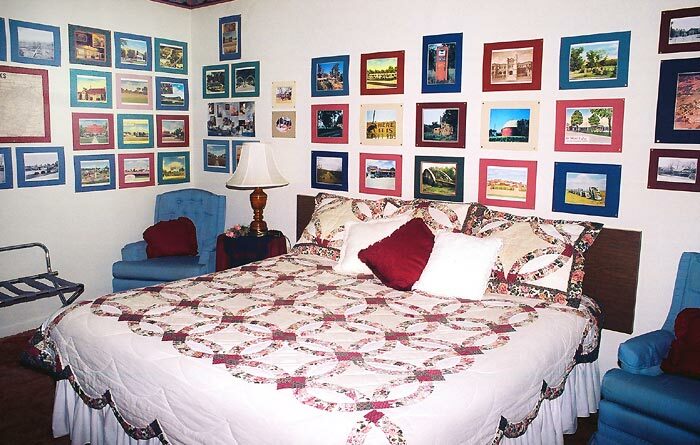 The "Route 66 Room" is the first theme room Ramona Lehman decorated. 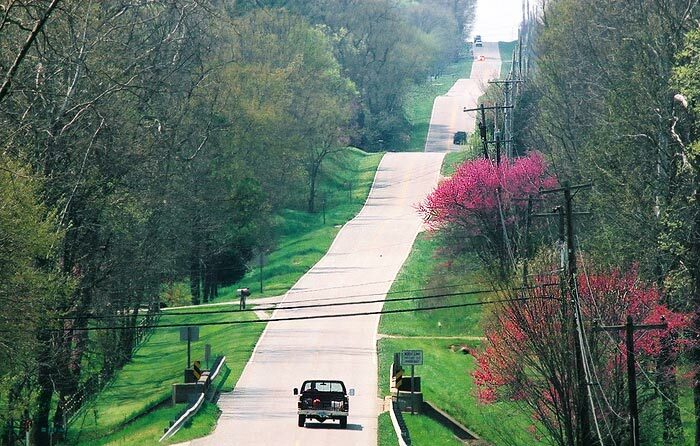 It features over 80 photos of Rt 66 locales. 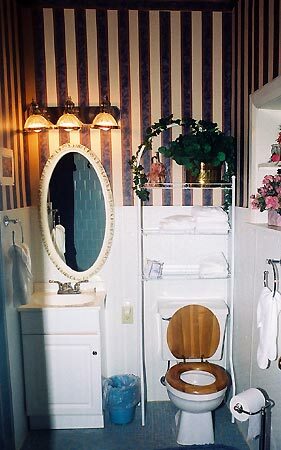 One of the things I've learned in the last year is to include motel room interior shots when possible. This is because one of the main questions I am asked in email is, to paraphrase: "nice neon sign, but what are the rooms like?" I don't stay at most places I photograph from the road, but when I do, I try to take a picture before I trash the room with all the stuff I bring in from the car. 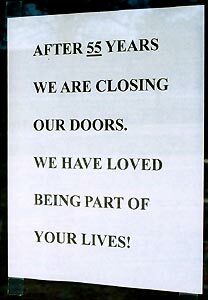 It was time for us to go. On the way to Joplin, where we were staying, I shot this probable former gas station east of Marshfield. This was the perfect Sunday drive. Sometimes I drive over the crest of a hill and Route 66 takes my breath away. This can happen on any road, for that matter. All roads go somewhere, and until we've been to as many somewheres as we can get to in a lifetime, we'll keep driving. Update, July 29, 2007 - Starlite Lanes no longer has the cool old sign, it was replaced with a backlit plastic one. 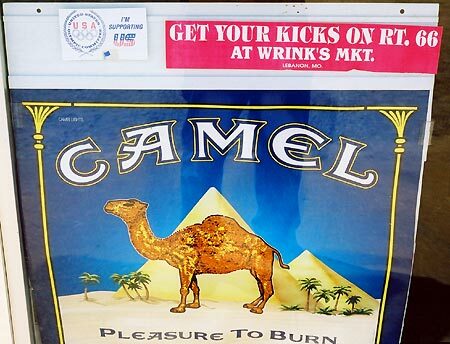 However, there is good news: Wrinks is back in business, run by Terry Wrinkle, one of Glen Wrinkle's sons. Change, death and renewel continue along the Mother Road. 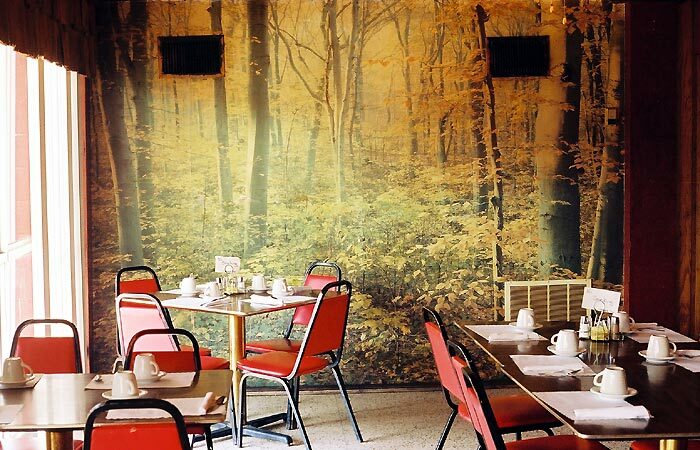 The smoking area of that restaurant looks like something out of a Coen brothers movie. Really enjoyed your visit to Lebanon. My work takes me there fairly often and I think it's a great little town. Your photography is wonderful--it's the kind of stuff I like to shoot and look at myself. Your last shot of Route 66 is breathtaking! Keep on truckin, Lope! I live in a neighborhood just behind The Bell, and Route 66 is certainly an important part of our town. Glenn was my grandmother's cousin and we were all very fond of him. It was always a treat as a kid to visit his store! If you're ever in the area again, I suggest you visit the Route 66 Museum located in the public Library. It's pretty neat. I have lived in Lebanon all of my life. It's so interesting to see our town from someone else's viewpoint. I consider myself blessed to have been raised on Rt. 66, and to have wonderful memories of the cool old places. Thank you for sharing your thoughts with us all! Thanks for this. I was doing some web surfing/remembering and I really appreciated your pictures. 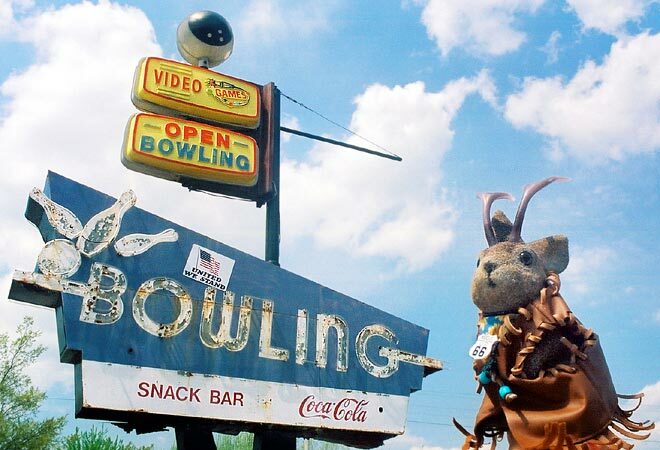 I lived in a trailer behind the Starlite Lanes from 1968 to 1974, when I left for college. 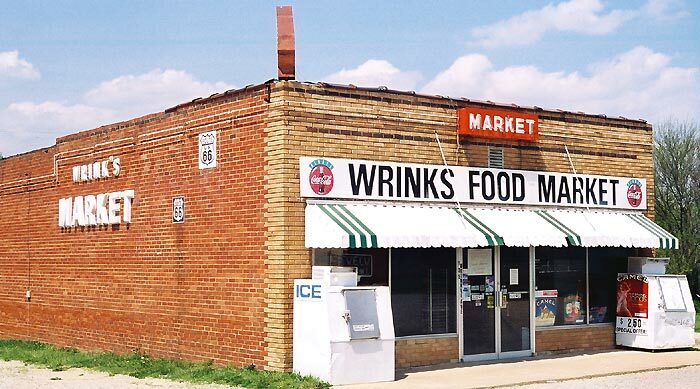 During that time, I worked for Wrink from 1970 to 1974 when I left. I started out at 60 cents and hour and finished up at $1.20 per hour...and loved every minute of it. One of the best things I remember working for Wrink was the special sandwich he would make me on Saturday's for lunch. I was only back to Lebanon once since I left, in 1977, and not since then. So I really appreciate your pictures. Thanks! I was born @ 123 hickory lane leb. 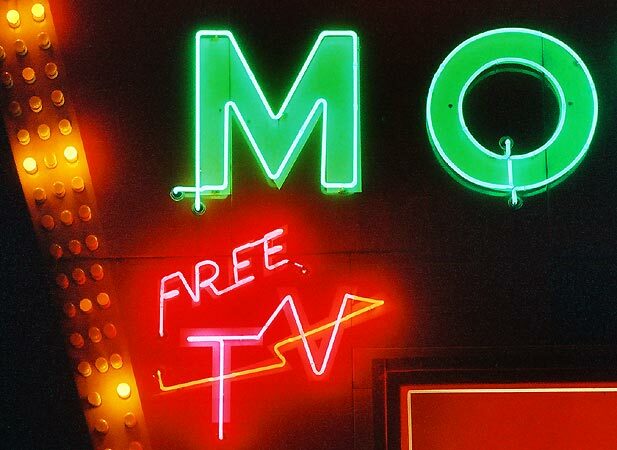 mo!